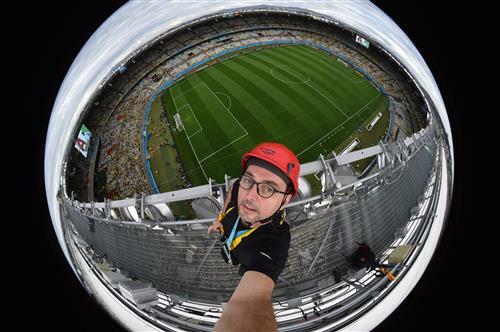 As Brazil 2014 heads towards its climax, CNN brings you live coverage of the first semifinal from Belo Horizonte. Brazil's worst nightmare has become its reality. Neymar, the young man carrying a nation's hopes on his shoulders, will watch from the sidelines as his teammates try to win the World Cup its nation demands. When the 21-year-old hit the deck following a challenge from Colombia's Juan Zuniga in Friday's quarterfinal victory, the country held its breath. After it was announced the talismanic No. 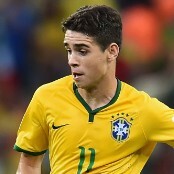 10 had fractured a vertabrae, Brazilian hopes looked dashed. Without Neymar, and deprived of the services of its captain Thiago Silva after he picked up a booking in that last eight win, would Brazil be able to overcome a strong Germany team in the semifinals? I'm Tom McGowan, myself and Chris Murphy will be your guides through the first semifinal of the 2014 World Cup. Germany certainly hopes so, Tom, and while there is a ton of pressure on Brazil and Scolari to deliver the World Cup to a fervent home support, there is an equal amount on the broad shoulders of Joachim Low. After eight years in the job and no major silverware bagged, it is time for him and Der Mannschaft to finally deliver a first major trophy since 1996. Maybe that's why Mr Low is cranking up a bit of pressure on the opposition. Not that this clash needed an extra layer of spice dusting on top, but while expressing his sympathy for Neymar's absence, he also labeled Brazil's quarterfinal clash with Colombia "brutal" and has called on tonight's referee to ensure this one doesn't go the same way. Good luck Mr Marco Rodríguez from Mexico. Germany has attracted a fair amount of criticism back home for the way it has played in some matches -- the extra time win over Algeria in the last 16 one that immediately springs to mind -- but I'll wager the viewing public won't mind how its team plays tonight, as long as gets the job done. Strong stuff from CNN's own John Sinnott. Do you agree? As always we want to here from you, let us know by posting a comment or by tweeting the hashtag #CNNWorldCup. 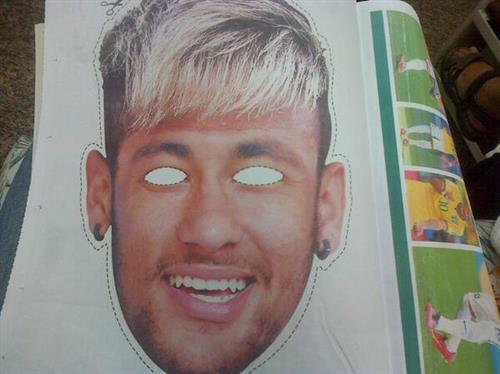 Neymar might not be taking to the field, but his face will be all over the Estadio Mineirao. The big team news ahead of kick off is that Bernard, the tiny schemer who is just 5 ft 5 ins tall, has the task of filling Neymar's shoes. It's not just Bernard who has a big job on his hands. With just under 30 MINUTES until the match gets under way, we've picked out our key men from either team ahead of this mouthwatering encounter. In the absence of Neymar, the creative burden will rest heavily on the 22-year-old. Despite scoring in Brazil's opening game, the playmaker has struggled to make an in his country's run to the semifinals. A big performance is needed if "A Selecao" is to book its place in Rio. He may not have all the tricks and flicks Neymar does, but Thomas Muller knows one vital thing when it comes to football on the international stage - sticking the ball in the back of the net. When he's not pretending to fall over in elaborate free-kick routines, the Bayern Munich star is generally scoring. He has nine goals in his previous 12 World Cup matches. Brazil beware. The teams are moments away from entering a frenzied Mineirao Stadium. Who are you backing? Let us know by posting a comment or using the hashtag #CNNWorldCup. I've a fair idea who is going to win the 'anthem off' and it won't be Germany, who go first. Prepare yourself for one of the loudest, most passionate renditions of Brazil's anthem in the country's history. There may well be tears. Wow. That was impressive, especially the a cappella second verse. 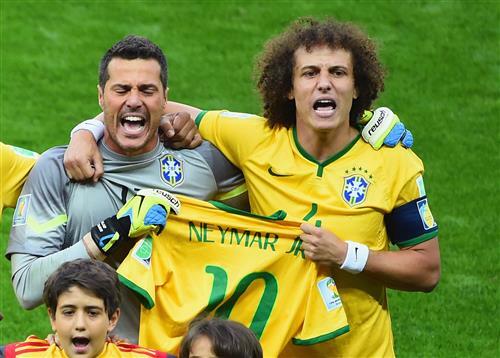 David Luiz and Julio Cesar clutch a shirt with Neymar Jr on the back in tribute to their injured comrade and even the mascots bash out the anthem with gusto. An expectant nation has done their part. Now it's up to the players. A bright start from the hosts inside the cauldron-like Mineirao. Marcelo with the first shot of the match, a drive which drifts wide of Manuel Neuer's goal. 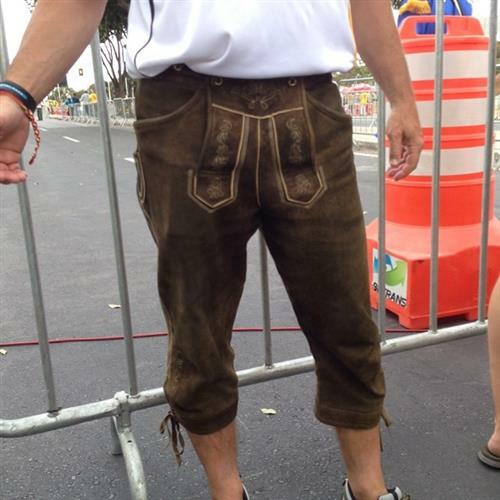 Hulk almost plays in Bernard moments later, but Neuer reacts well to gather. There are no half measures when it comes to singing the national anthem. Germany showing its attacking prowess for the first time, Sami Khedira sees his goal-bound shot inadvertently blocked by teammate Toni Kroos. The contest has started at a frantic pace, neither team able to keep hold of the ball. 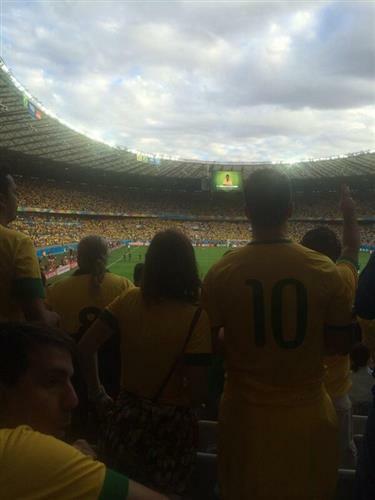 BRAZIL 0-1 GERMANY! 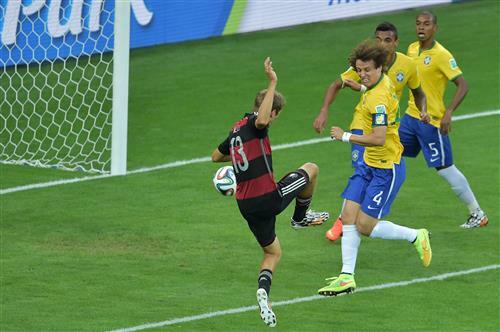 Thomas Muller (11 mins) A nightmare start for Brazil! Muller is left completely unmarked as Kroos' corner drifts into the six-yard box, the forward able to compose himself before firing a side-foot volley beyond goalkeeper Julio Cesar. What has Brazil got in response? Hulk tries to provide an instant equalizer, but his cut back fails to find the onrushing Bernard. In Neymar's absence, does Brazil have enough? 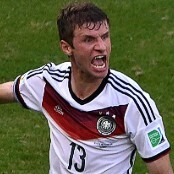 13 - Thomas Müller is the 13th player to reach double figures for #WorldCup goals and the 5th German to do it. Bakers. Brazilian penalty appeals waved away by our Mexican referee. 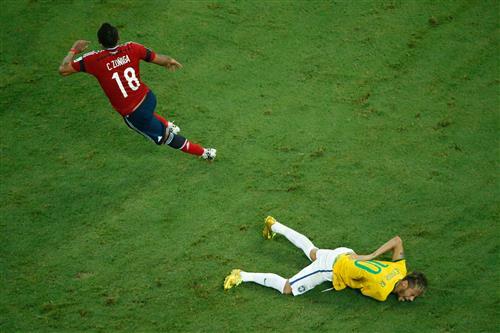 Marcelo burst into the area, but Philipp Lahm executes a perfect sliding tackle. No spot kick given and rightly so. 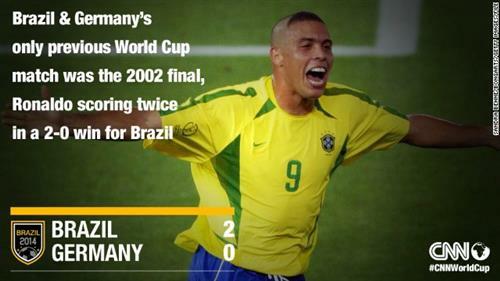 BRAZIL 0-2 GERMANY! Miroslav Klose (23 mins) It goes from bad to worse for Brazil! Miroslav Klose converts from close range after Cesar had saved his initial shot and becomes the World Cup's all time leading goalscorer! BRAZIL 0-3 GERMANY! Toni Kroos (25 mins) Brazil is shellshocked! Kroos fires home brilliantly from the edge of the area after a brilliant move and eventual cross from Philipp Lahm. Belo Horizonte is silenced. BRAZIL 0-4 GERMANY! Toni Kroos (26 mins) I'm lost for words! Brazil has fallen apart in spectacular fashion. Fernandinho caught in possession straight from kick off, Kroos plays in Khedira before accepting the return pass and finding the back of the net. Two for him FOUR for Germany.